Got a 2nd good review for my book, a collection of 10 plays, that I wanted to share. Community theater groups are booming across the U.S., but inevitably audiences get tired of seeing the same old familiar plays. That’s where Tom Hendricks’ Ten Short and Short-Short Plays can come in handy. Hendricks takes some old plays and rewrites them with his own twist, but also has some totally new ideas. For example, in his “William Tell: The Play,” a group of actors are doing the original play when the actor playing Tell, after receiving a head injury, shoots a real arrow at his stage victim. Some of his plays are based on works unfamiliar to the modern audience — for example, his “Manikin and Minikin” is based on a 1918 play by the same name by Alfred Kreymborg – so viewers will likely be seeing the story for the first time. He also presents his own take on Shakespeare’s comedies, Greek myths, and the Book of Job. Pills,” in which Larry is put on trial for selling sugar pills for “whatever ails you” and presents a unique defense. 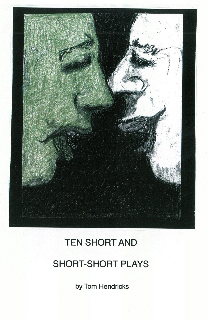 All in all, fans of short plays will be sure to enjoy Tom Hendricks’ Ten Short and Short-Short Plays.